In 1980, a perfect storm came together in terms of radio drama revival. Top talent of the classic era of radio and modern entertainment worked hand in hand on Mutual Radio Theater, a multigenre show harkening back to classic anthologies of the past. Each program was written specifically for radio and included scripts penned by such radio legends as Arch Oboler, Norman Corwin, and Elliot Lewis. Each night's program featured a particular genre and was hosted by a different performer, including Lorne Greene, Andy Griffith, Vincent Price, Cicely Tyson, and Leonard Nimoy. 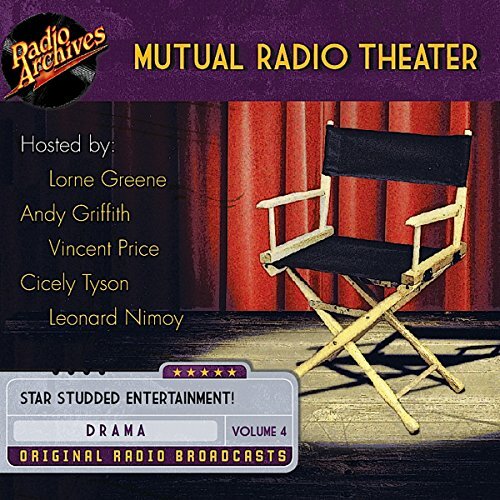 Twenty episodes are featured on Mutual Radio Theater, Volume 4, presented as they originally aired, complete and uncut, with original commercials and produced in full stereo high fidelity!